“Being a Mellow Parenting Facilitator (MPF)”…. M = Marvellous interaction with parents and parents-to-be….. the groups are so relaxed and informal, and although the programme content is always delivered, being parent-led means we, as facilitators, can deliver the sessions in such a flexible way to suit the needs of the group. Therefore each parent feels they are being listened to, valued and respected. P = Powerful emotions can be unleashed within these sessions…..parents may find themselves pouring out thoughts they’ve kept inside for a long time. Mellow groups can enable parents to feel safe, secure and appreciated in a non-judgmental way, which in turn, empowers them to speak from the heart. Parents may find themselves revisiting their past, and challenging historic (or current) relationship issues. Tears may flow (and have done on many an occasion! ), however there is always a box of tissues on the table, a comforting shoulder and a listening ear at a Mellow group! 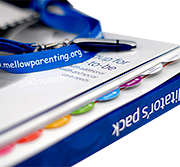 I have been trained as a facilitator for Mellow programmes for just over a year now, I have been involved in the organisation and facilitation of Mellow Babies, Mellow Toddlers and Mellow Bumps. The groups have all been very successful and the satisfaction of watching a group coming together is very rewarding. Families involved always love the group content and build up good relationships with other parents, often leading to lasting friendships. Families never want the group to come to an end and so many parents wish they could do it all over again. It’s very rewarding to see parents making changes in their lives, moving on to other groups and seeing their confidence building over the weeks. These parents are clearly taking steps to make a difference in their children’s lives, improving the quality of interactions as well as improving not only their own but their children’s life chances. Having spent a lot of years as a worker advising parents what to do and not sharing any information about myself I was concerned on a personal level that I would find it difficult to take part in the group in every activity along with the parents, share my own personal experiences and not be in charge!! However, co-facilitating not only the first Mellow Dad’s in Fife but also the first Mellow Futures for Dads in Scotland the exact opposite has happened. The trusting relationships that are built up in the group mean that I am comfortable sharing personal information, and it has given me the opportunity to reflect on how I was parented and in turn how this influenced my own parenting style. What is invaluable is the support that group members offer to each other and how getting advice from your peers can have so much impact. I have learned so much about myself as a person, a worker, a mum and like the parents who take part this will stay with me forever. For the past four years I have been a Mellow Facilitator, during this time I have lucky enough to organise and co facilitate Mellow Bumps, Mellow Babies and Mellow Toddlers. Although the content of each of these groups doesn’t change I do like that there can be can be a little flexibility of the running order of the weeks. This allows you to consider individuals needs and situations, which I feel helps to ensure that everyone gets the most from each session and that topics are covers just at the right time for that particular group. If I was asked what I love the most about the Mellow Programmes I would have to answer – Watching the stages and changes of each group. In the beginning – Parents who are nervous, quiet, shy and a bit apprehensive about the whole “group” thing. Midway – Parents becoming more confident as individuals and also in their role as parents. stronger bonding and attachments with children, a safe and secure feeling amongst the group, a boost to peer support and parents who have or are forming lasting friendships.